Carlos and his team were exceptional in their attention to detail . I now have the stone wall in my kitchen that I had always imagined! I wanted an old European look with natural stone. 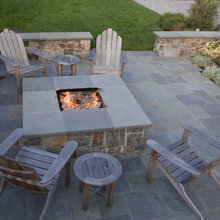 We had used Carlos before for an outside job- beautiful work on our patio/pavers. We had teams of people working on the remodeling of the kitchen. Carlos and his team were so accomadating in working with our schedules. His stone wall is the centerpiece of the kitchen! He is a master at his craftsmanship and he has an eye for creating the vision of his client. He is an artist! Thank you so much for your time and review. Really appreciate the opportunity to work for you. I would give 100 stars if I could. 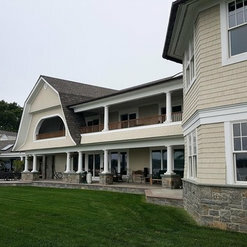 We have been working on this house for many years and many projects. It can be very trying to find contractors that simply call, show up, do what they say and do it well. Carlos is all that and more. 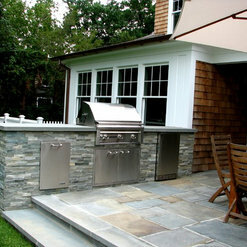 He removed and rebuilt a chimney and did it really well, making everything so easy no stress. Everything done and cleaned up in even less time than we thought. I would highly recommend giving him a call. 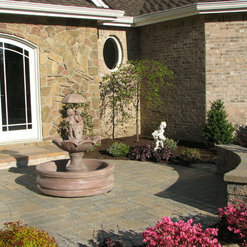 Just to get it out of the way as early as i can my experience with Castro Stoneworks was exceptional. 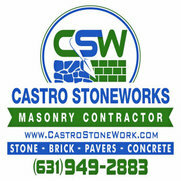 With that said i met Carlos Castro after another masonry company backed out of the work at my house .I reached out to a friend for a referral and he gave me Carlos's cell phone number and website Once i saw the website i thought no way is this company coming to my house to install an 800 sq feet patio and walkway. His work on his website is very telling about Carlos and his company. His worked is based in the Hamptons mostly. Need i say more. I decided to reach out to Carlos and he showed up at my house on time and dressed in a professional manner. I told him of my thoughts on my walkway and patio and he spoke with me in detail about the work and made me feel very comfortable. I asked Carlos about some ideas I had and we went thru each one. He measured and took his time like this was big job. I was impressed right then. I received a very reasonable quote a few days later in a PDF format in my email. Once i looked t the price i knew i would be using Castro Stoneworks. His prices were on par with the big companies. Carlos told me when he could start the job and its completion. In the mean time he sent me to all County Block to check out the stone color i wanted because Carlos told me its better to see the stone in person .He was right big difference. I settled on Toffee Onyx Lite. The day came for the work and Carlos and his crew were at the house at 7:30 AM. I was greeted by all the workers with a "Good Morning". That was just the start. Carlos walked with me thru the project. He stayed and answered all my questions. One of the best parts of the job was his brother Roy who was the foreman of the crew. He answered my questions s he worked. Roy and his crew installed pop up drains on my walkway that are connected to my gutters so rain would not interfere with the brick. The crew also installed a pipe under my walkway to a small island in front of the house. This is to be used for future lighting or Irrigation. What a great idea. Carlos did all this without extra charge. Carlos was at my house for the five mornings the crew worked on the house. The crew worked from 7:30 AM - 5:30 PM for all the days they were at my house. Carlos ordered the brick and the border from All County Block and it was there on time the first day. when the crew was ready for the concrete again it was there on time with no delays. I cant tell you how important that is to me to have work constantly being done and supplies being on time. The job was completed in the five days he said it would be. I could not be happier with the work, the crew and Carlos himself. 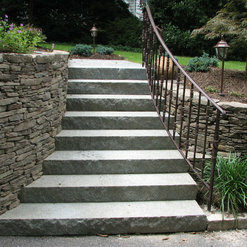 If you are doing any type of masonry you have to give Castro Stoneworks a call. Carlos and his crew are very experienced in all phases of brick work. Carlos is a very humble person and easy to speak with. He has multiple crews working different jobs so your work will get done sooner than later. His crew and his brother Roy were extremely pleasant to speak with and did a wonderful job for me. I could not ask for anything more.The compliments i have received on the patio and walkway are so positive. One happy customer. I will be recommending your company to friends and family and will have you back to do work in the future. Thank you Carlos and Castro Stoneworks for a job well done. They just completed our front porch and walkway in June 2018 and I could not be happier with the work performed by Castro Stoneworks. They were true professionals and exceeded our expectations. Carlos and his crew were very professional and their work was exceptional. They completed our job in a timely manner and were very clean. Carlos was also very approachable with any questions or issues. 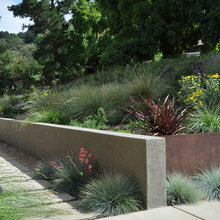 Castro Stoneworks was a pleasure to work with. Carlos was on the job everyday checking on the progress. His workers were pleasant and neat. 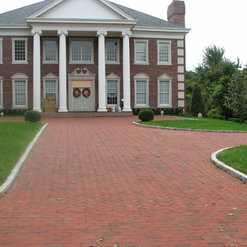 I was so pleased with my patio that I have contracted CSW to do my driveway and front walk. Castro Stoneworks truly deserve 5 stars. 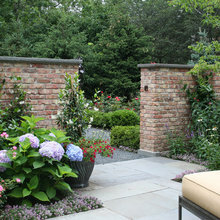 They did impressive masonry, began and ended on time, and were a pleasure to deal with. So pleased with how our patio turned out. Carlos and his crew were very professional. The work was done timely and they cleaned up after. A few weeks after install we accidently had wood stain fall on our patio. We tried ourselves to get it clean but to no avail. Called Carlos and he came next day with a product to remove the stain. We would highly recommend them. Carlos was very professional. He came to my home to see what I wanted done and gave me an estimate. 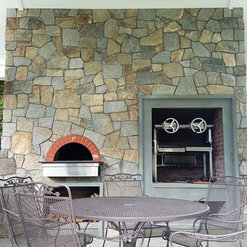 The stone I picked out was very tedious to install so the price did go up a few hundred dollars but was nothing extraordinary. Carlos came by every day to check on the job, the workers were very good and cleaned up the area upon completion. My stone fireplace came out beautiful. The stone goes up to my ceiling, it is impressive. Everyone who sees it compliments how it makes the room..
Carlos Castro truly understands, creates, and loves fine stonework. He and his crew are simply amazing! 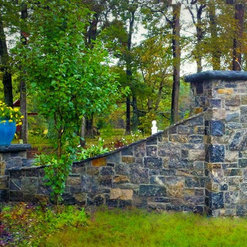 They applied a stone veneer to the foundation and sides of my home by meticulously cutting every small stone generating a perfectly beautiful and natural look. 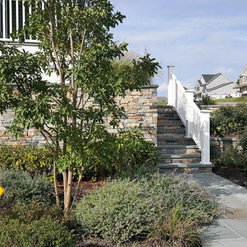 Using bluestone, they also constructed a walkway, front porch, stairs, and 400 square foot patio for my home. Their work required careful demolition, and leveling concrete foundations. Carlos' crews worked every day from 7 AM until dusk, and never left until their work was completed and the site left completely spotless. Carlos visited the site each and every day (sometimes multiple times) to ensure that the work perfectly matched my architectural plans. His team was creative and flexible to fit my needs. I simply can't praise his team any more for their professionalism and respect for my home, family, and pets. 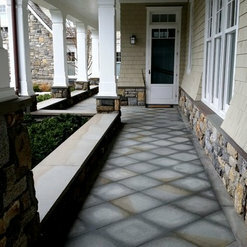 I will use and highly recommend Castro Stoneworks for any masonry project. Thank you so much for your positive review we appreciate it very much. I found the entire experience of working with Castro Stoneworks as 5-Star. 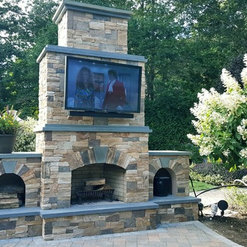 From the proposal stage, where the owner, Carlos, brought my wife and I to look at similar outdoor fireplace projects to get ideas, to the finished project. I found Carlos to be straightforward, fair, honest and trustworthy. He viewed my project like he would a project at his own house. He made us feel comfortable throughout. He was not pushy, and I did not view him as a typical salesperson. In fact, he talked us out of things that would have been more costly. I found each member of his team to be very knowledgeable and skilled in their craft. They answered any questions we had on a day by day basis as the project progressed. The workmanship was fun to watch. Artists with stone. The crews were courteous to the surrounding area, cleaning up each day. I also felt very comfortable leaving the crews unattended at my house. I could not of asked for a better experience and would recommend to anyone that has a high quality stone project that they need completed.